This article covers the generic assessment and management of the pain with abdominal pain without shock. Patients with acute abdominal pain are a common reason for attendance at the emergency department (ED) and account for approximately 10% of all attendances . Patients can be difficult to assess and make an accurate diagnosis in the ED. It is important that we have strategies to identify those patients who require admission, and recognise those patients that need resuscitation. This session covers the generic assessment and management of the patient with abdominal pain without shock. The specific management of abdominal conditions for example appendicitis, will be covered in additional sessions. Acute abdominal pain is normally thought of as pain of less than one weeks duration. 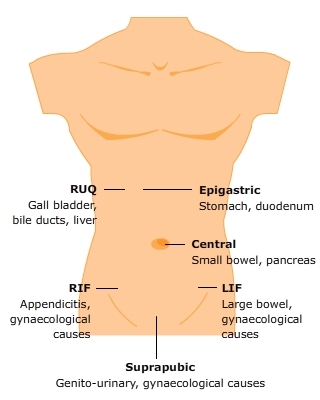 To aid initial diagnosis, investigation and management, abdominal pain can be categorised into one of the five areas displayed (Fig 1) [1,4]. 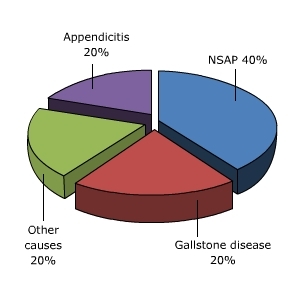 There are many causes of acute abdominal pain, although in terms of ED presenters the following approximate ratios are applicable (Fig 2) [2,3]. Pain associated with the abdomen falls in to one of three types and it is important to identify this at the earliest possible stage. The autonomic nerve supply innervates organs and when these organs are stretched vague, poorly localised pain is generated (Fig 3). If these organs are affected by peristalsis then this pain can appear intermittent or colicky in nature. Organs are innervated bilaterally so pain is often felt in the midline even if the organ is not actually positioned in the midline. Visceral pain is normally localised by the patient to the embryonic site of the organ, which may be different from the actual site, for example, the periumbilical pain of early appendicitis (Fig 4). 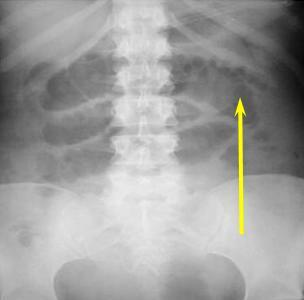 This type of pain is due to irritation of the parietal peritoneum and is well localised to the site of the organ, for example the right iliac fossa (RIF) pain of later appendicitis . Pain may be felt at a distant or referred site to the organ due to misinterpretation of stimuli by the brain, again based upon embryonic development of the nervous system. An example of this would be diaphragmatic irritation due to blood can be felt at the shoulder tip . Pointers toward referred pain include an apparent lack of expected abnormalities on examination for example, a normal shoulder examination, in a patient with shoulder pain. It is vital to take an accurate pain history as this can provide important information. Sharp, constant pain worsened by movement may represent peritonitis. Pain more marked than physical findings suggests ischaemic bowel or pancreatitis. Pain due to inflammation of an organ tends to come on gradually and results in guarding on examination. 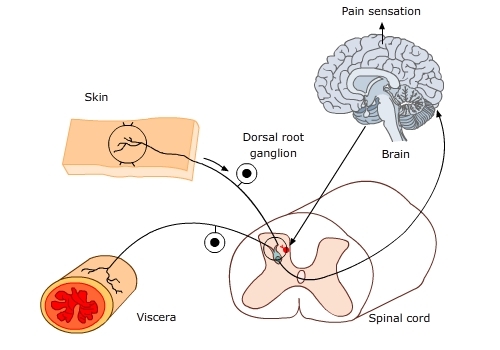 Pain due to obstruction tends to be intermittent and come in waves (Fig 2). Pain radiating to the back may represent aortic aneurysm rupture, peptic ulcer disease or pancreatic pathology (Fig 3). The first examination made will be the one performed when you first meet the patient. Important information can be gathered by looking at patients from the end of the trolley. You should determine whether they look ill or in pain. Patients who appear comfortable and apparently well, often are, whereas those who are anxious, in obvious pain, pale or clammy often are not. This may appear obvious but is often forgotten when presented with a confusing array of information. It may also guide the choice of immediate therapy and investigation. 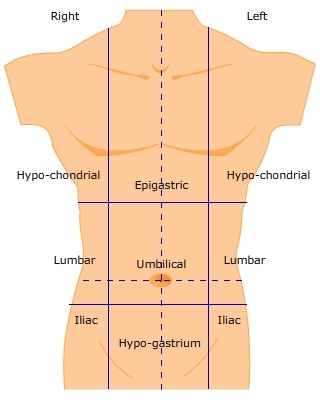 Traditionally, for the purposes of examination the abdomen has been split into four or nine quadrants. A simplified classification is shown (See Fig 1) [1,2,4]. It is important to gently palpate each of these areas looking at the patients face for signs of pain before proceeding to deep palpation. On examination, note any tenderness or guarding, for example, tender to light palpation in the suprapubic area but without signs of guarding. It is important to reassess the abdomen regularly as serial examinations by the same physician may reveal worsening pathology e.g. peritonitis. Do not forget to check for organomegaly as this is an important part of the abdominal examination. There are very few specific risk assessment tools for patients with abdominal pain. 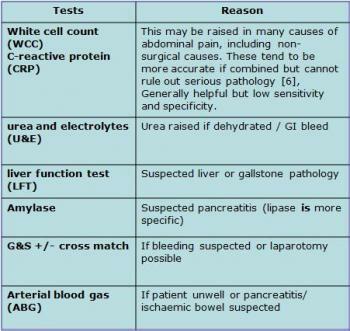 One of the few conditions to have a widely used risk assessment tool is pancreatitis. Question: Can you think of any higher risk groups that may present with abdominal pain to the ED? It is necessary to maintain a low threshold for admission in patients from these at risk groups. Elderly patients have an increased mortality due to co-morbidities, increased incidence of serious and rapidly progressive pathology and atypical signs . 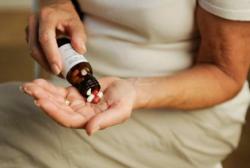 They are also much less likely to have non-specific abdominal pain. Good clinical assessment is the mainstay to making a diagnosis in ED patients with abdominal pain. However, investigations are a useful adjunct but should be interpreted as such and not over-relied on. It may be necessary to resuscitate if signs of sepsis or haemodynamic instability are shown, furthermore if there are any concerns or patient is unwell, discuss with ED senior. Morphine IV titrated to effect. A Cochrane review states that there is no evidence that opiates mask the signs of peritonism or lead to a delay in diagnosis. Analgesia should never be withheld until the patient has seen the surgeon. There is no evidence for anti-spasmodics like Buscopan in the management of acute pain . IV anti-emetics Metoclopramide theoretically increases gastric emptying so other anti-emetics such as cyclizine and ondansetron have been favoured although there is little evidence to support this . Anti-pyretic (IV paracetamol if necessary). It may be necessary to use a Nasogastric tube if a bowel obstruction is present. It may be necessary to use a Urinary catheter if the patient is unwell or peritonitis is suspected. Broad spectrum IV antibiotics if there are signs of sepsis or peritonitis. Keep nil by mouth and give IV fluids (normal saline). If there is no evidence of a significant surgical pathology, the patient is pain free and has a normal examination then it is reasonable to discharge the patient home with clear advice to return to the department if their pain recurs or they have any concerns. It may also be appropriate to arrange a review 12-24 hours later. Patients with suspected biliary colic who have pain that settles can often undergo USS followed by discharge or be brought back the next day for an USS. 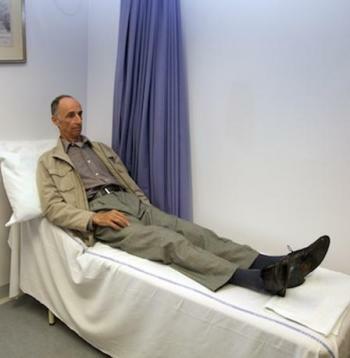 Elderly patients and those with significant co-morbidity should be admitted as they are at much higher risk of significant pathology. It is not uncommon to reassess a patient who initially required morphine for pain to find them pain free with a soft abdomen. Remember these patients have had IV opiates and their pain may recur once this wears off. In general they need to be admitted for observation and possible further investigations. The surgical management of abdominal conditions will be considered within the various sessions of this series. In general there are several strategies. Role of serial clinical examinations over time, best performed by same senior surgeon. 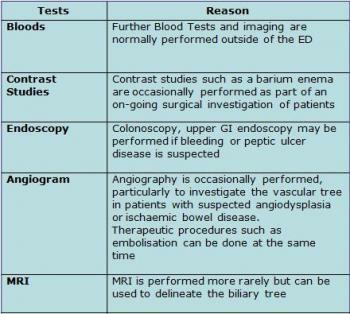 Observe and re-examine with USS/CT or endoscopy. Diagnostic laparoscopy is particularly useful in women of child-bearing age where there is a high incidence of tubo-ovarian pathology. 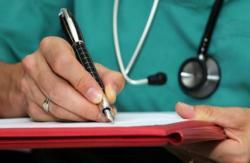 If a surgical condition is found then the patient may undergo a specific abdominal procedure, such as appendicectomy. If a surgical cause is likely, but the nature remains unknown then surgeons may undertake a diagnostic laparotomy. Surgeons will make the decision to operate by weighing up the risks and benefits of laparotomy versus conservative treatment. An exploratory laparotomy will give a cause for the abdominal pain in around 80% of patients. Consider based on history. 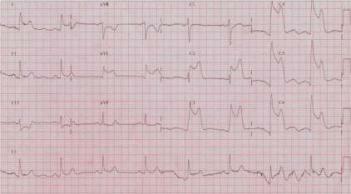 If in any doubt obtain an ECG. MI (especially inferior MI) can present with minimal or even no chest pain. A history of diabetes with possibly some prodromal infective symptoms and vomiting may be clues but a bedside glucose should always be taken and followed up with serum/urinary ketones and arterial blood gas. To complicate matters further it is important to remember that some abdominal pathology may be the initiating factor in DKA. This can present with abdominal pain, either non-specific generalised pain or related to renal colic. Other features may be present including vomiting, weight loss, change in bowel habit and anorexia. Check serum calcium and albumin level (remember to correct calcium for hypoalbuminaemia). This may present as non-specific upper abdominal pain. Vomiting may be a feature and respiratory symptoms may be minimal. 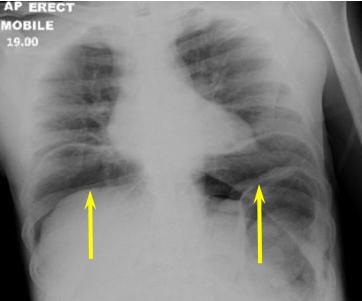 Be alert to unexpected hypoxia and obtain a CXR. This straddles the distinction between surgical and medical condition. It may present with abdominal pain during acute flare but can also present due to perforation or obstruction. A previous or prodromal history may be present but may be short in a new diagnosis. Usually presents with lower abdominal pain but may radiate into the flanks or be primarily located in one renal angle in pyelonephritis. Departmental dipstick analysis may give a clue but if suspicious send for urgent gram stain. Any patient who represents to the ED with the same symptoms within a few days of discharge is at high risk of significant pathology. A few patients will present to the ED with recurrent or chronic abdominal pain. It is important to treat each presentation at face value. There is a higher mortality in frequently attending patients and if in any doubt seek senior staff guidance. Consider functional abdominal pain in patients who have had previous repeatedly normal investigations and multiple presentations. Consider social and medical input into these patients through case management. It may be appropriate to consider referral to chronic pain or mental health teams. Warning signs include patients who repeatedly present to different hospitals, have multiple scars from abdominal surgery or who often self-discharge after being given analgesia (particularly opiates). Forgetting to examine the hernial orifices and missing an incarcerated hernia (Fig 1). Relying too heavily on inflammatory markers -they are non-specific. 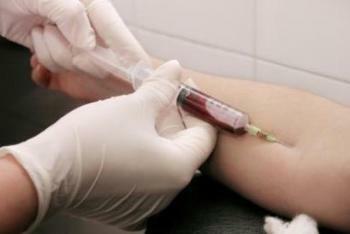 Fail to perform an hCG in all females of child-bearing age may fail to diagnose an ectopic pregnancy. Furthermore beware discharging the patient who is pain-free after morphine, the pain may well recur after the analgesia wears off and they should really have a period of observation. Do not forget that medical conditions can cause abdominal pain, it is disastrous to miss an inferior MI or DKA. 40% of patients presenting to the ED will ultimately have a diagnosis of non-specific abdominal pain. Analgesia should never be withheld until the patient has been assessed by a surgeon. 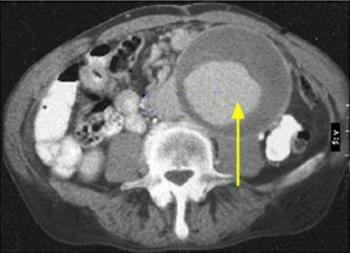 CT and USS are the imaging modalities of choice in a patient presenting with abdominal pain. Plain x-rays are of little benefit. 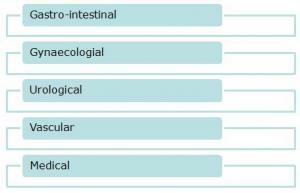 Raised WCC and CRP are helpful but non-specific and will be raised in a multitude of causes of abdominal pain. The elderly with abdominal pain are much more at risk of having a significant pathological cause for their abdominal pain. Taking an accurate pain history and performing a thorough abdominal examination is the key to the ED assessment of patients with abdominal pain. Demonstrate physiological principles to your clinical assessment of the abdomen and to formulating a differential diagnosis. 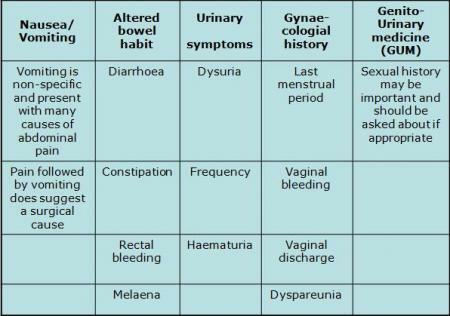 Recognise the importance of history and examination in determining the cause of abdominal pain. Demonstrate a rational approach to diagnostic investigations in patients with abdominal pain. Identify non-surgical causes of abdominal pain and manage them appropriately. Fairclough PD, S.D., Gastrointestinal disease, in Clinical Medicine, C.M. Kumar P, Editor. 2005, Elesevier. Patterson-Brown, S., The acute abdomen, in Principles and Practice of Surgery, e.a. OJ Garden, Editor. 2007, Churchill Livingstone: Edinburgh. p. 332-340. 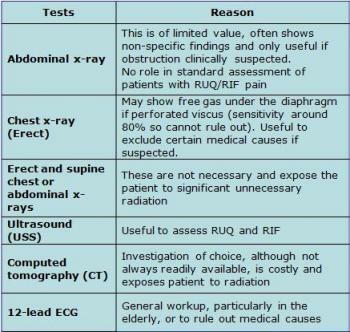 King KE, W.J., Abdominal Pain, in Rosens Emergency Medicine: Concepts and Clinical Practice, H.R. Marx JA, Walls RM, Editor. 2006, Mosby: Alibani. p. 1343-54. Gallacher, J., Gastro-intestinal emergencies, Acute abdominal pain, in Tintinallis Emergency Medicine: a comprehensive study guide, G. Tintinalli JE, KD, Stapczynski et al, Editor. 2003, McGraw-Hill. p. 487-593. Palmer LR, P.I., Patterson-Brown S, Alimentary tract and pancreatic disease, in Davidsons Principles and Practice of Medicine, e.a. Haslett C, Editor. 2006, Churchill Livingstone: Edinburgh. p. 599-683. Haldane, C. Does a normal CRP exclude serious pathology in the patient with acute abdominal pain. BestBets 2008 [cited 2009 9th September]. Lameris, W., et al., Imaging strategies for detection of urgent conditions in patients with acute abdominal pain: diagnostic accuracy study. BMJ, 2009. 338(jun26_2): p. b2431-. Manterola C, e.a. Analgesia in patients with acute abdominal pain. Cochrane Database of Systematic Reviews 2007 [cited 2009 9th September]. Mackaway-Jones, K. Buscopan in abdominal coli. BestBets 2003 [cited 2009 9th September ]. Hassan, Z. Is cyclizine better than metoclopramide in patients with moderate to severe abdominal pain? BestBets 2005 [cited 2009 9th September]. OKelly T, K.Z., The acute abdomen and laparotomy, in Surgical emergencies, D.G. Monson JRT, OMalley K, Editor. 1999, Blackwell Science: Oxford. p. 85. Very good and well structured article. 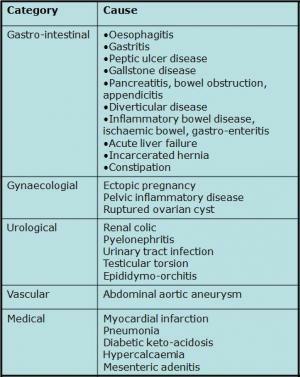 Regarding chronic abdominal pain presenting to ED, certain rare conditions could be picked up by emergency physicians for example Porphyria or Familiar Fever (e.g Mediterranean). short but comprehensive coverage of pathophysiology, DDs, management. an area that would need further consideration would be on abdominal POCUS for AE clinicans to identify appendicitis, gall stones and gyn conditions.